With inside information, behind-the-scenes interviews and exclusive music & pictures, this is the place to be! If you fell down the rabbit hole and happened upon a concert held in the royal hall of some neverland, neverwhere, neverwas; this is the band you would find performing. The musical inspiration of Among the Weeds is comprised of many elements, but the basic idea was to borrow the best of the past and combine it with new ideas to create something not necessarily limited by genre or aesthetic. Innovative and complex muses surge beneath the surface. With obvious echoes of a range of electronic music from decades past, they still stand out as their own sound in their own time. It may be true that many of the elements presented in Among the Weeds can be heard in other places...but how can borrowing the best of all great things be bad? 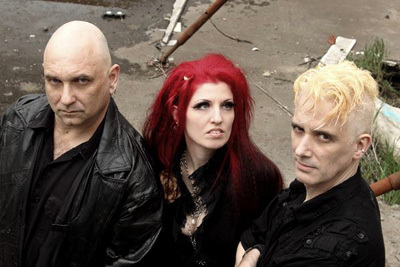 The band began as a solo project of the founder, Rose Z. Vine, when she ended up bored and isolated in a small town in 2005 with no band and a limited amount of gear. It went through many different phases but the introduction of Mike 'Moose' Best from the band alaskahighway at the end of 2006 after her return to Los Angeles was the most notable one. He added a depth and complexity to what had been mostly drum loops, simple synth lines and vocals. This combination would be the first time the project performed live; the debut being in the middle of an alaskahighway set at the (now defunct) Barcode in Las Vegas. After a few adjustments, including the addition of a bassist and guitarist and a handful of live shows in LA, the band relocated from Los Angeles, California to Portland, Oregon in 2008; a short time later releasing their debut album frail tin beauty in 2009. There were a few bumps and bruises along the way as they grew and the project gradually evolved into what it is today; rounded out by the addition of David K. Anderson, formerly of Written in Ashes and Luna's Ceiling. 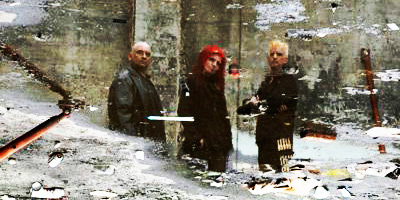 The trio released the follow up album Temple of the Machine in 2011. So, fall down the rabbit hole, take the red pill and slip into the world of the nether, the ether and the spirit. Let Among the Weeds be the soundtrack on your journey and hold on tight. Should Among the Weeds appear at a venue near you, do not be late. You have a very, very important date.